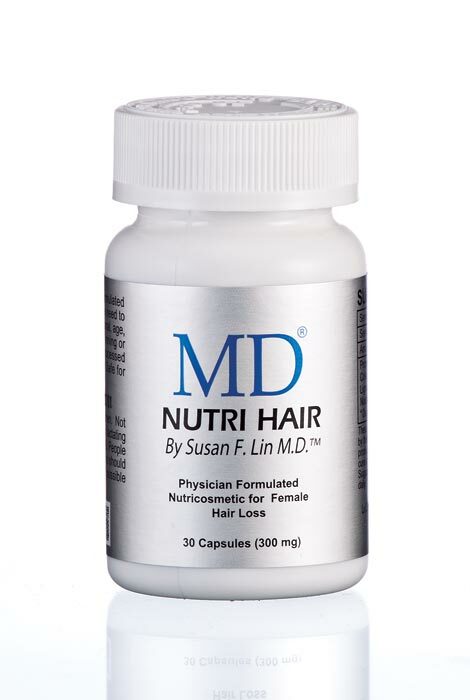 Designed by a practicing physician in women’s health, MD® Nutri Hair is a daily supplement designed specifically for female hair loss. Using natural lilac extract to offer a protective barrier and help balance hormones on the scalp, its incredible antioxidant benefits address hair loss from aging and stress. Collagen, Flaxseed, Lignan Powder, Vitamin E, Niacin and Biotin nourish, stimulate and support re-growth and maintenance of healthy, lustrous, more youthful looking hair. Use alone or in combination with your daily hair care regimen. Many women see results in as little as 30 days! Includes 30 capsules. Collagen (Fish), Flaxseed Powder, Lignan Powder, Syringa Vulgaris (Verbascoside), Vitamin E, Niacin (Niacimide)-Vit B, Biotin. For adults, take 1 capsule daily. teenager. I am positively thrilled with this product! I read the review & received a newspaper clipping from someone. I need something to help my dry scalp and dry hair. I hope this helps. This product seems to be working on me. I would recommend! I am open to try new item and hope that it meets my need. my hair is getting thin want something to improve the condition of my hair. It gave my hair back its luster. Does it work for alepcia ? BEST ANSWER: Thank you for your question. This is not a hair regrowth product, you may want to look for something with minoxidil for and ingredient. We hope this information will be of help to you. I don't experience too much hair loss but my hair is thin and less than others (seem like it is only half of theirs). I can easily see my head skin when looking to the mirror. So I'm wondering whether this product can make my hair stronger and growing more, I mean the number of hair, not the length? Thanks. BEST ANSWER: Thank you for your question. Yes this item will help you with having more hair. We hope this information will be of help to you. Could I get a breakdown of the amount (milligrams) of each ingredient, and the type or source of the ingredients in MD Nutri Hair? BEST ANSWER: Thank you for your question. Our vendor does not disclose the percentages of ingredients; this is what keeps it proprietary. We hope this information will be of help to you. That is very disappointing. I've tried so many hair supplements for my fine, thinning hair and was unable to tolerate them. This one sounded promising. Oh well, back to my search. Thanks for your time. How long does it take to start seeing results ?